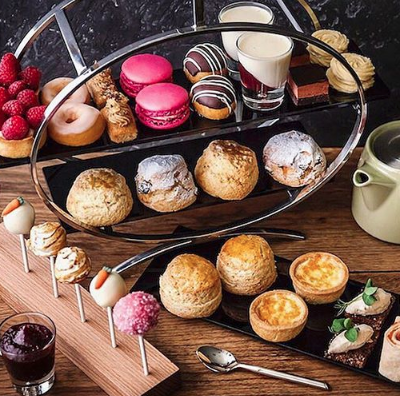 It’s winter, the season of hot drinks and comfort food, and what better place to satisfy such requirements than in The Dorchester hotel’s Promenade. On London’s five-star studded Park Lane, it’s a long, elegant venue that draws an international crowd. The lounge furniture is portly and positioned at just the right height for the table laid with pretty crockery and silverware. Large doughy scatter cushions make it even more comfortable to sit back and listen to the live piano accompaniment in between bites. Service (other than being provided during my visit by two waiters, the first noticeably less sociable and cheery than the second) is superb, with handbags awarded their own perches. 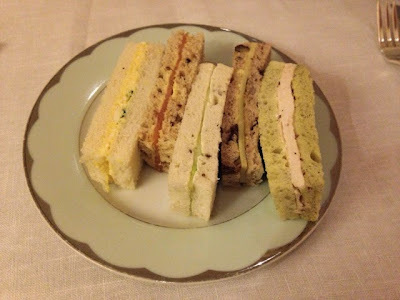 The sandwiches with fillings of smoked salmon, cheese and mango chutney, egg, chicken and thinly sliced cucumber, are a tasty warm-up to the scones, and are topped-up until you’re full-up. Especially mixed for the hotel, The Dorchester’s tea blends include a perfumed Earl Grey that brings together Sri Lankan Ceylon, Indian Assam and Taiwanese Formosa Oolong. There’s also a choice of black and caffeine free. Some slightly wonky, the tiered cake stand is weighed down with homemade scones, served with clotted cream and jam, and crowned with cakes and pastries. The attention to detail is uniform, from the honeyed glaze on top of each scone through to the delicate gold flakes that ensure the sweets have extra dazzle. 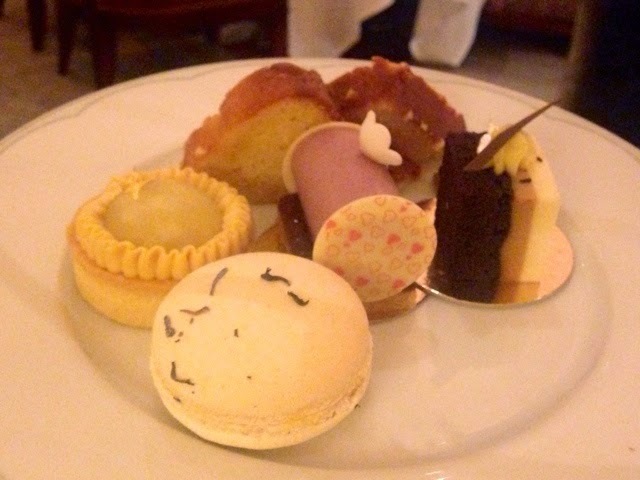 If you don’t manage to finish it all you can take a cake box home for later. 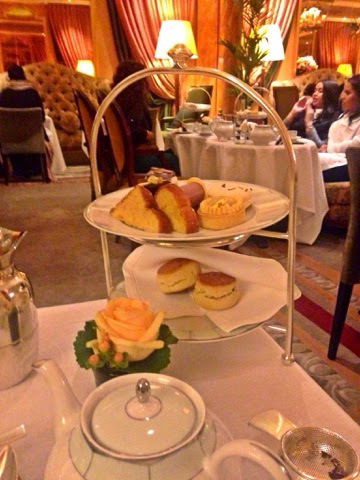 Served six times a day from 1pm, the theatre of Afternoon Tea continues up to a balcony that overlooks the marble pillared Promenade. If you’d like only a little bit of what you love, The Spatisserie, a softly-lit feminine space in the hotel’s spa, serves a slightly more guilt-free tea - notice the macaroons are ever so slightly more dainty than those served elsewhere. Attire is a little more informal as guests may be in robes, but it’s still an occasion entirely appropriate for champagne.